A new First Vanguard for Pale Moon is revealed, that rotates between the Soul and Rear-guard Circles. AUTO [Soul] Generation Break 1: [Counter Blast 1] When your Main Phase begins, if you have a “Harri” Vanguard, you can pay the cost. If you pay it, Soul Charge 1, Call this card to (RC), during that turn, this card gains Power+2000. AUTO (RC): [Soul Blast 1 & Place this card into the Soul] When your turn ends, you can pay the cost. If you pay it, choose 1 of your Rear-guards with the Magia ability, return it to the hand. 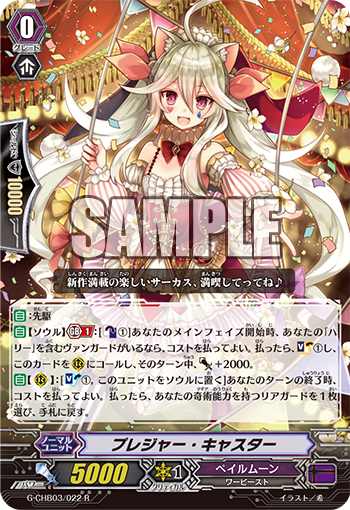 For Today’s Card, we’re introducing a 《Pale Moon》 from the 3rd Character Booster “Rummy Labyrinth in the Moonlight” (on March 3rd, 2017), the First Vanguard “Pleasure Caster”. “Pleasure Caster” is a First Vanguard for “Harri” Decks. When your turn ends, you can Soul Blast 1 card and place this card into the Soul, to choose 1 Rear-guard with the 【Magia】 ability, and return it from the hand. From there, it’s possible to return cards to your hand that were brought out from the Soul to a Rear-guard Corcle with 【Magia】. This allows you to activate the ability of cards like “Dagger Magician, Ety” whose abilities activate when they are placed on the field from the hand, by retunring them to your hand. So next turn they can keep coming out, allowing you to use their Call ability. And when your Main Phase begins and you have a “Harri” Vanguard, you can Call this card from the Soul to a Rear-guard Circle with Power+2000! And you Soul Charge 1. When the turn ends, you Soul In, and when your Main Phase begins, you Call it out, allowing you to keep reusing its ability every turn. “Rummy Labyrinth in the Moonlight” has many Units that further enhance 《Pale Moon》, so look forward to future information! And today’s “Weekly Vanguard News Bits NEXT” will have a Fight using cards from “Rummy Labyrinth in the Moonlight”! So be sure to check it out!